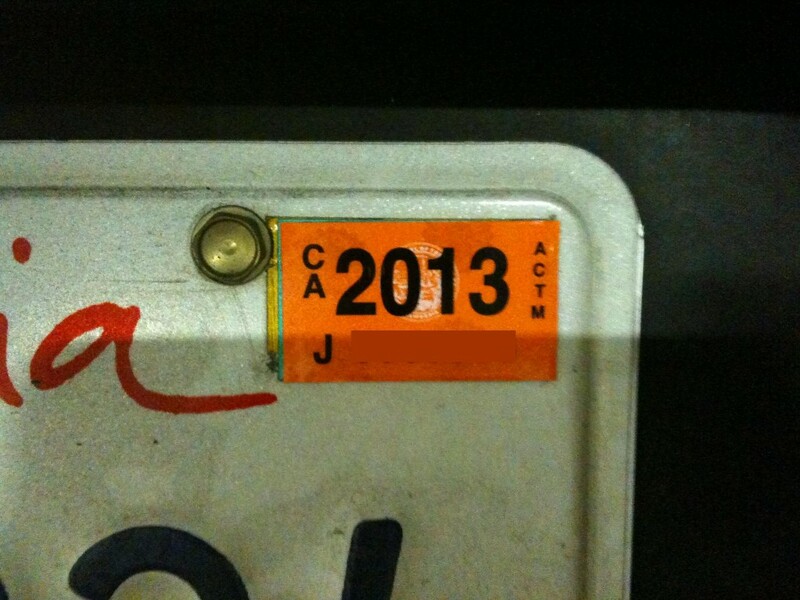 My DMV sticker came today. Can you believe we’re half way through 2013 already? In February of last year, a good friend stayed at our apartment for a long weekend. On his second day, I took him to a Filipino restaurant in San Mateo for brunch. We arrived early, so the place, called Kuya’s, hadn’t opened yet. As we waited outside the establishment, I noticed how my guest started to shiver from the late-morning cold. 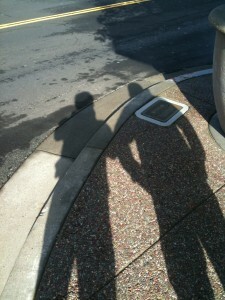 So I found a patch of sunlight, stood there, and asked him to join me. When he stepped into the light, relief from the cold was almost immediate. It was as much a surprise to him, as it was to me the first time I noticed the temperature differences between light and shade in my first winter in Taiwan. I snapped the following photo to commemorate the “aha” moment. Under the blazing tropical sun, shade is associated with relief. Leaving the shade for relief was a foreign concept. It’s a lesson that you learn quickly, however, even in sub-tropical countries that don’t really have snow — like Taiwan. I experienced an even sharper contrast between light and shade when I went to Kanata, Canada (a suburb of Ottawa) on a business trip a couple weeks short of Christmas. This is what greeted me on my first morning. 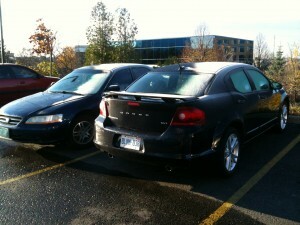 Overnight, a layer of frost had formed on the cars in the hotel parking lot. 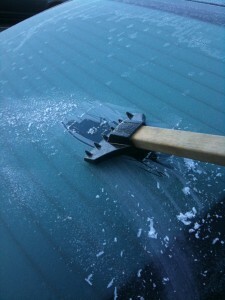 This wasn’t California-style, turn-on-the-wiper-and-you’re-done frost. You actually had to scrape this stuff off. Surprising as that phenomenon was (it was the first time I’d ever had to drive in that kind of weather), what even more surprising was how the curvature of the windshield was enough to keep the morning sun from melting all of the frost. Hence the powder-white patch on the right side of the car. For most of my stay at the hotel, I parked where the photo above was taken. However on Thursday night, there was a hockey game at a nearby stadium and game parking spilled over to the hotel parking lot. So I ceded my usual spot and parked behind the hotel building. It seemed like a good idea at the time since there was virtually no competition on that side of the building. I found out why the following morning. The parking slots there were completely shielded from the sun. So I had a whole lot of scraping to do. I know my east coast and European friends who are more accustomed to full-blown winters will look at that picture and laugh. But hey . . . we don’t have that issue in the tropics . . . or California for that matter. It was as new to me, as the light-and-shade revelation my friend experienced in February. The things I enjoy most about travelling are the little discoveries that tell you “you’re no longer at home”. A close second is taking visitors, who are new to my part of world, around to experience the sights, sounds, and tastes of my living space. Through their comments and questions, things that had become routine and mundane become fresh all over again. Thank you for that visit my friend, and for that re-discovery of the non-tropical relationship between light, shade, and temperature. 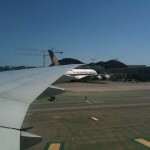 I’ve been travelling for a few years now, and have been on over a dozen airlines. This remains the most entertaining inflight safety video yet . . . happily its from the motherland. The Philippine Airlines website presents the following information the travel tax on their FAQ. Sadly, the link on this page that is supposed to take you to a government site for more information leads to a site that has been suspended. 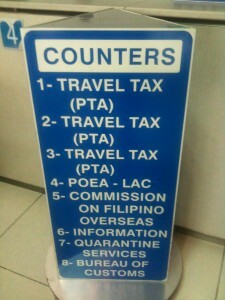 How much is the Philippine Travel Tax? 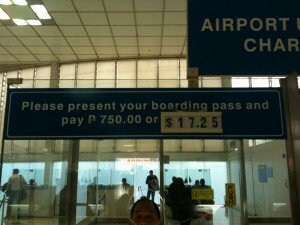 For adult passengers, the travel tax is PHP1,620 (Business and Economy class) and PHP810 for children (2-11 years). I bought my ticket from your website. Is travel tax already included in the total amount paid? No. 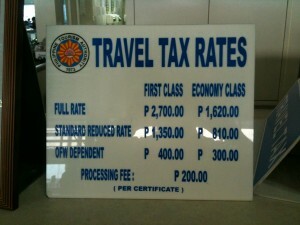 Philippine Travel Tax is not included in the total fare quoted online. For international journeys, Philippine travel tax, if applicable, shall be collected by the Philippine Tourism Authority at Philippine Airports. Travel tax shall be levied on (a) all citizens of the Philippines; (b) permanent resident aliens; and (c) non-immigrant aliens who have stayed in the Philippines for more than one (1) year, who are leaving the country. How much airport terminal fee will I pay for my flight? Airport terminal fees are PHP550 (effective 01Feb12) for international departures and PHP200 for local/domestic departures. These fees will be collected at the Ninoy Aquino International Airport (Centennial Terminal 2). For AirPhil Express code-shared flights, PHP200 per passenger will be collected at the NAIA Terminal 3. If there is anything about going home to the Philippines that I really really hate, it’s dealing with the cash-only terminal fees at the airport. The first time I ran into this was on my first return trip to Taiwan in 2000. The explanation they gave me for the fee was that since my ticket was purchased outside the Philippines, it did not include the terminal fee in the ticket price. So I had to fork out the funds myself — on the spot. Over the years, I had learned to deal with this gargantuan incovenience by making sure I always had the required amount with me long before I got to the airport. But on my last visit to the Philippines after a lengthy hiatus, my initial calculations proved insufficient. The fees had gone up significantly, and I had to go through the expletive riddled experience of finding out that there were no ATMs past the secure zone of the security area . . .
. . . and that I had to exit the building . . . find an ATM . . . and then re- enter the security inspection line. I typically arrive well ahead of my flight, so getting in the first time was a breeze. Not so after the trip to the ATM. By the time I returned to the security line it had grown to a very long slithering snake. Virtually every foreigner I know who visits the Philippines for the first time, and who unfortunately didn’t have a friend or family member who was familiar with this procedural frakas, goes through the same W-T-F experience that I went through above. It is counter-productive tourism to promotion efforts. 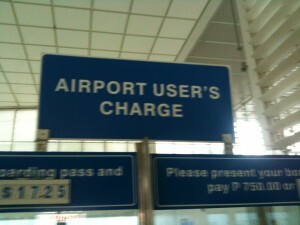 This blatant display of inefficiency is the last thing tourists see as they leave the country. What do you think they will tell their peers about their experience? The Department of Tourism promotions budget for 2012 is P250M wouldn’t it be a shame for all that money to only bring in one-time-only visitors who don’t come back? I don’t know about you, but I feel mooched when I pay with these fees. It doesn’t matter how polite the people at the fee collectors are, these feel like superfluous fees because its just doesn’t make sense to collect them separately from the ticket . . . and in cash no less. No credit or debit cards allowed. Given how cash transactions are associated with efforts to avoid scrutiny . . . it just leaves a bad taste in the mouth. This problem has been around for over a decade now. If a problem this simple can’t be addressed . . . how much more with even more complicated problems? 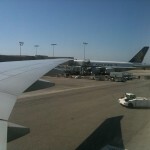 2011 was a very quiet year travel-wise. Only one trip to Canada, and that was it (lots of snow-related observations on that trip, but that’s for another post). 2012 is shaping up to be more interesting. 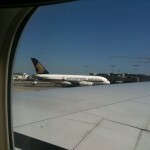 One of the side-benefits of travel is plane spotting. 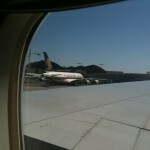 This is the first Airbus A380 I ever saw. Thanks, in no small part, to the fact that I couldn’t get an aisle seat on this flight from Taipei. My wife and I have been renting an apartment in Sunnyvale since 2004. It’s been a nice place to live, but I had always looked at it as a temporary place to live. Things changed on the 28th of March, when I finally bought my own townhouse — still in Sunnyvale. So now, this place is really HOME!!! So I’m creating a category just for my new hometown, documenting life in a city. Things to do (or lack thereof), and places to eat. The Visa Collector now has a home base. My wife and I welcomed the new year in San Francisco. We booked a room at the Hyatt Regency, had dinner at E&O Trading Co., and proceeded to the Sinbad Restaurant parking lot to watch the city’s fireworks show. The show actually lasted 15 minutes, but I only took 3 minutes of it so that I could focus on the spectacle. Too bad I didn’t record the “smiley face” and Saturn-shaped blooms. The following ABC News reports provides some insight into the rationale behind those warnings about cellphone usage during take off and landing. 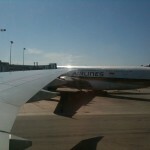 They are, reportedly, more of a concern on older aircraft that lack specialized shielding. Looks like the Department of Foreign Affairs is looking for ways to improve their services. Passport processing at the mall. Great idea. With both the Gaisano and Robinsons groups taking part, that means that this won’t be just a Metro Manila-only offering. Filipinos planning to go abroad may soon apply for passports at malls. The Department of Foreign Affairs (DFA) on Friday announced that it will soon start moving its regional consular offices to shopping malls around the country in a bid to improve passport services, and save the government millions of pesos as well. “With this move, the DFA is taking a big leap forward as it can now more effectively deliver consular services to the public in modern, more applicant-friendly settings at very little cost to the government,” DFA Secretary Albert del Rosario said in a statement. He said he expects to begin transferring the first of nine regional and extension offices to some of the country’s leading malls that are covered under Private-Public Partnership arrangements before the end of the year. “This is expected to save the government over P250 million in the next 10 years,” he added. The DFA has entered into Memorandums of Agreement with the Gokongwei-owned Robinsons Land Corporation and the Gaisano-owned Pacific Mall Corporation for the transfer and hosting of an initial six of the 18 existing DFA regional consular and extension offices and two new regional offices.